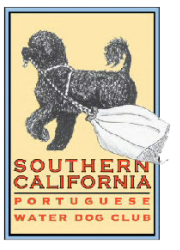 Welcome to the Southern California Portuguese Water Dog web site, and the wonderful world of PWDs! Our club was established in 1990, and our members cover a wide geographical area and possess a wealth of knowledge in a variety of dog-related interests, including tracking, obedience, rally, conformation, water work, agility, therapy dog service, political action issues, rescue, grooming, and living in harmony with one of the world's most interesting, fun, frustrating and challenging dog breeds. Our members benefit from belonging to our club by receiving an annual membership directory, periodic updates on club events through our newsletter and email notifications, having the ability to serve on a number of club committees, the Board of Directors, and vote on important club issues. We offer our members the opportunity to participate in events ranging from water training practices, water trials, the Family Pet Expo, training and grooming seminars. If you would like to get to know local PWD owners and their dogs, we invite you to attend one of our upcoming events listed on the Calendar page, or call one of the club contacts for more information. We look forward to meeting you! To join our club, please fill out a Membership Application and mail it to the address listed on the application form. To renew your current SCPWDC membership, fill out the Membership Renewal Application. Renewals are due on January 1st of each year.